DEAR ELIZABETH: Isn't it amazing how tranquil a walk in the garden can be? I get great pleasure from walking through and around the different shade gardens my wife has planted. The garden stepping stones she had me install not only add to the beauty of our gardens, but they also keep my shoes dry and mud-free. 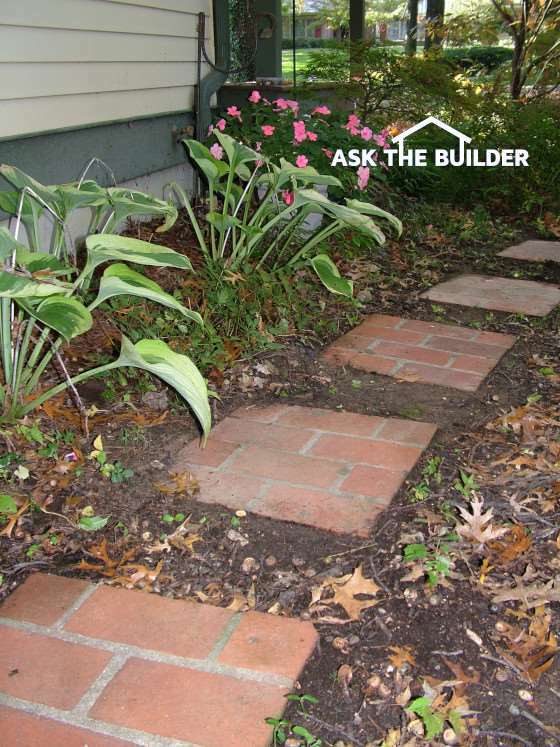 The best stepping stones for garden paths are usually flat sedimentary or metamorphic rocks. Limestone, slate, flagstone, and quartzite are some of my favorite rock varieties. Coarse limestone that contains abundant fossils makes for a stepping stone that has superb slip-resistance and natural beauty. You are lucky to have this type of rock near your home. You might be able to get slabs from creek beds or road cuts on a state highway. Quartzite is a very interesting garden stepping stone as many of them glitter when they are highlighted by sunbeams. When wet, quartzite can produce deep colors that may compliment your plants. This stone is also extremely durable and will wear better than iron. You can also make your own stepping stones with concrete. Irregular molds and stamping kits allow you to create stepping stones that resemble cobblestones or slate. It is also quite easy to cement thin paving brick to pre-cast concrete slabs. These stepping stones look more formal, but the red brick really blends well with the shades of green found in just about every garden. The sizing of the stones is fairly critical. A garden stepping stone that is too small offers a small target as you walk through the garden. Stones that are too big tend to overpower the pathway. I have found that garden stepping stones that are roughly 18 inches wide by 14 inches deep are ideal. The stones should be approximately 1 to 1.5 inches thick. They can be thicker, but this just creates more work for you as thicker means heavier. The spacing of stepping stones is controlled by your gait. You can measure your gait easily by getting the bottom of your feet wet, and then walking on dry pavement. Measure the distance from the center of one footfall to the next. The odds are you will discover the average adult gait is approximately 24 inches. People who are taller with longer legs will have a longer gait. To keep stepping stones free of mulch and mud, they should be installed so they are higher than the surrounding ground. Rookie gardeners frequently dig shallow holes and plant the stones as they would a plant making the top of the stones level with the surrounding dirt. This locks the stone in place, but also allows the stone to get covered easily with debris. You can still make the stones look flush with the surface ground by placing dirt around the edges of the stones and then flaring this dirt out into the garden. Each stepping stone will then be a small plateau within the garden. The slope away from each stone will be so gentle you will not see it, but water will not flow up on the stones unless a Biblical storm inundates your garden. Try not to carry the stones to your garden. Make use of a wheelbarrow or a two-wheeled cart used by deliverymen. Either tool allows you to bring the stones one by one into the garden with ease. I also urge you to wear thick gloves to protect your hands while working with the stones. You can easily pinch your fingers while trying to take stones from a stack. If you decide to make your own stepping stones using paving brick, build them in place exactly where they will rest in your garden. The combined weight of paving brick, cement mortar and a pre-cast concrete pad for just one stepping stone can easily exceed 125 pounds or more. Cold weather can cause frost to form in the soil. This may cause the stepping stones to tilt one way or another until such time as the ground thaws. If the stones are out of kilter after the spring thaw, level them by placing sand under the low part of the stone. Natural stone will rarely require any maintenance. Harder stone like limestone, quartzite and shale will last generations. In fact, they will last thousands of years with little or no wear. Visit a stone supplier to get the widest variety of stones, and be sure to ask about durability and relative hardness. Stones that have a high quartz-mineral content will be harder and will last longer.